Well, you know what they say about middle books. It's hard to talk about the middle book in a trilogy without some SPOILERY*SPOILERS, but I will do my level best. Reader Gut Reaction: Well, you know I had some major love for the first novel in this series. Though others talked about seeing the twist in the plot coming early, I had only the lamest suspicion until All Was Revealed. So, I was caught off-guard; the writing in the first novel took me in and held me under until the book was finished in a single gulp. It wasn't like that with this one. I have a problem sometimes when I begin to care about a character. I cannot - cannot! - bear to let anything happen to them. Dumb, I know, but keep in mind I was the wee girl praying for Batman every week, okay? I just wanted him to be okay. Readers always want that, but it makes for very boring fiction. So, Things Must Happen. Painfully. Concerning Character:So... Sage. Yeah. Last we met him, he was a scrappy, foul-mouthed, hard-headed, stubborn thief. As it turns out, he's a HARD-HEADED, NUMB-SKULLED, STUBBORN SON OF A ...queen, and he's made it home in one piece, mostly. But, he's barely there before it turns out that his country doesn't really love him, and doesn't even want him. And he's hurt. So very, very hurt. And when he's sent away to be kept safe, after an assassination attempt that comes far too close, he realizes that the threat to his country begins and ends ...with him. And thus, once again Sage comes up with the OH, MY GOSH WORST IDEA, EVER, in the world. ...because I knew he was going to leap onto this bad idea with both feet. And the stakes in the plot were thus being raised to a dizzying height, in some kind of game of life/death that just COULD NOT end well. 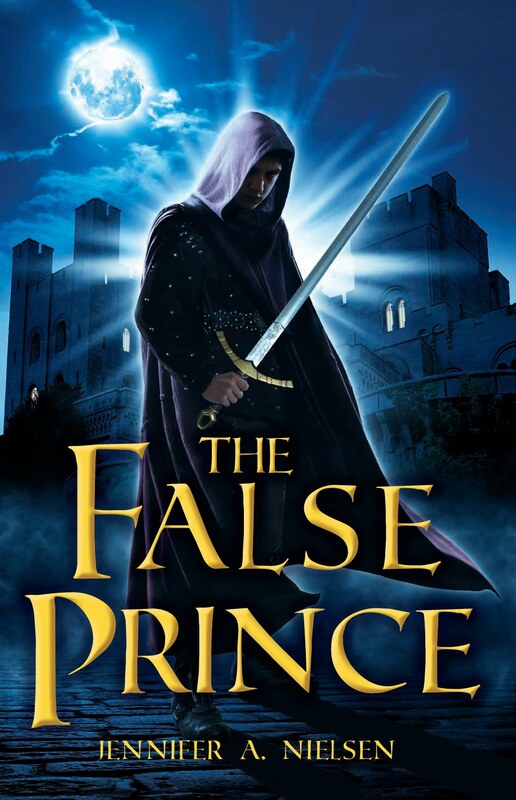 Readers began to care early on about this very scrappy character in the last book - and his arrogance (READ: fear) and stupidity (READ: fear) often cause him to cut off his nose to spite his face. And then to see the potential for it happening -- again. Only, this time, that he might end up cutting off his whole head to spite... something?? It gave me scairdy-cat vibes, and I had to pull back. All of the doubts Sage had in the first book weren't revealed to the reader - we saw him primarily from the outside, for the most part, being a sap-skull and getting beaten for his pains. This time, though, we know every doubt, ever fear, and feel every risk twice as much. It's excruciating. It's...painful. It's going to make the third book something we all are just a little ANTSY for, by the time it's released. What? Oh, you thought I hadn't finished it? Oh, ye of little faith. Recommended for Fans Of...: The Attolia books, by Megan Whalen Turner, THE WHIPPING BOY, by Sid Fleischman, THE LUMATERE CHRONICLES, by Melina Marchetta, THE PRINCE AND THE PAUPER, by Mark Twain. Cover Chatter: The deceptively simple cover is back, this time with a broken sword instead of a broken crown. In the book, there's a wooden sword that breaks inconveniently - which brings this to mind. 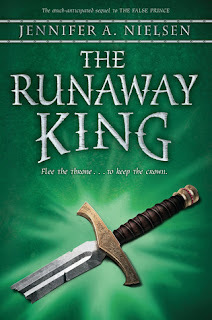 Just like eventually there was more than one cover there's more than one cover for THE FALSE PRINCE, there's also the UK cover for THE RUNAWAY KING. And yet, I think I still like the American one better. No face - no body - just the symbols of a ruler - shattered. It makes a statement. FTC: ARC by NetGalley and Scholastic; this was an unsolicited review. 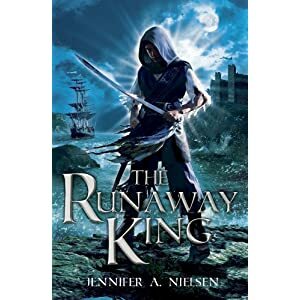 After March 1, find THE RUNAWAY KING, The Ascendant Trilogy, Book 2 by Jennifer A. Nielsen online, or at an independent bookstore near you!